This story follows Yūichirō (Yuu for short) Hyakuya and his best friend Mikaela (Mika) Shindo. Vampires capture Yuu and Mika (as well as the rest of the children at the orphanage where they lived) when a virus kills everyone over the age of thirteen. The Vampires bring them, and almost all who survived the virus, to their underground cities to be their “cattle”. After four years of captivity they make a plan to escape. This manga is a pretty young one (only thirty-three chapters so far), so I was surprised (but also delighted) when I learned it was going to be made into an anime. The story kicks you in the feels right from the first episode/chapter. So much so that It almost feels underhanded. The story has characters of the classic shonen age but the story is darker than most other shonen (similar to “Hunter x Hunter”). The story deals with emotional and physical trauma (PTSD etc.) but the story also has humor and light spots. There are epic battles (though the story is not overrun by them), and friendships. I find the manga’s art to be amazing. There is so much detail in the uniforms, hair, eyes and backgrounds. I was so happy to find that the anime did the drawings justice. The anime’s soundtrack fits the the atmosphere of the story very well. I didn’t like Yuu or Mika’s voices in the Japanese version (though I did like all the other voices) and I did find that the English dub was pretty good (not that I’m surprised since Funimation is the one who made it). 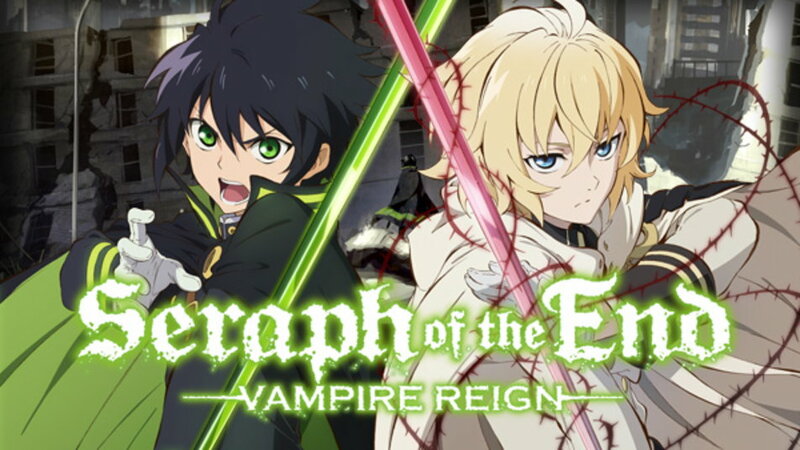 If you like vampires, dystopian worlds, and magic swords then I think you may want to check this anime/manga out.